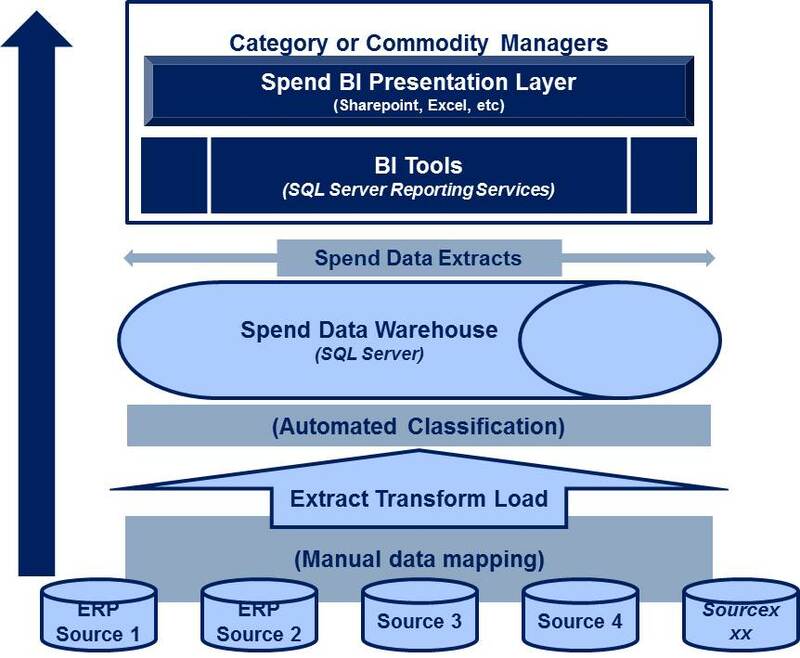 As a result, we are seeing a lot of interest around Spend BI and Analytics projects. Chief Procurement Officers and other Sourcing/Procurement leaders of Global, large and even mid-market firms are increasingly focusing on spend data analytics as part of a new wave of spend rationalization projects. The spend $ numbers are staggering. At a large multi-national industrial firm with $55 Bln in revenue, the indirect spend is $9 Bln and direct over $25 Bln. The opportunities for savings are tremendous. Spend BI and analytics can provide the visibility and insight needed to improve procurement performance. Spend management provides many cost reduction opportunities thru visibility into direct and indirect procurement, IT hardware, software, and services, and logistics, transportation and inventory costs. However, getting a 360 degree view of spend data is extremely challenging in most organizations. A large part of this is due to the number of fragmented solutions that contain spend information. In one firm we are helping, there are 32 ERP instances that capture PO transactions. Then there are cash disbursements systems, shared services systems, manual systems, and so on. You get the complexity. Another part is due to poorly implemented solutions where data as it flows from transactions systems to BI dashboards via an extract, cleanse, classify model is getting corrupted. Sometimes the classification is wrong resulting in incorrect aggregates. As a result there is limited trust in the numbers presented in the dashboard. Poor quality of spend data coming from procurement and ERP systems is another big problem. Business practices that improve data — name-and-address cleansing, record matching and merging, house-holding, deduplication, standardization, and appending third-party data — are often not followed. The one-time data cleanup done for an ERP implementation or consolidation is recurring more frequently as the pace of mergers and acquisitions increases or another round of cost takeout ensues. Carveouts, M&A often mean that the new company’s data needs cleansing and deduplication. Spending analysis for strategic sourcing has shifted from a yearly event to continuous tracking of vendors and categories to enforce spending policies. More rapid new product introductions mean more new materials, suppliers, and products. Data quality also becomes more critical as companies move to single global instances of ERP and other enterprise applications. Global scope means more individuals are responsible for entering master data, and companies are tracing the root cause of approximately 50% of help desk calls for these applications to master data errors. Even worse, the BI or data warehouse group is fighting these same data quality problems, resulting in duplication of effort. So what is the solution? Either fix the raw data -> insights chain which is hard to do in a large firm after the solution is deployed, or leverage sophisticated data analysts to do forensics and recreate the spend cube for targeted insights. Given the time pressure to generate results, some companies tend to go with the sophisticated data analysts who can interpret the nuances in the data. Data quality is absolutely critical for good fact driven decisions. Best in class organizations are increasingly noted for their ability to analyze spend and identify opportunities for improvement. What materials has the procurement organization purchased last year? In what volumes and for what prices? How has that changed over time? How many skus do we carry on our material list? Has this increased over time? Can we consolidate or substitute items to maximize buying power? What % of payments are duplicates? How is the total landed cost of a material distributed across unit cost, and other carry costs? Has this changed? What types of requests (MRO, manufacturing job orders, MRP) by volume have been processed? Do patterns reveal opportunities for streamlining? Are different demand channels ordering similar commodities? Can we synchronize needs across channels or substitute materials for consolidated buying? What does our supplier landscape look like? How many vendors have we purchased from this year? On average how much is spent per vendor in a specific period? How do vendors rank by volume and revenue spent? How has that changed over time? How many vendors do we have for a specific material or material group? What percentage of the volume is sourced from a single supplier? How do prices compare across vendors for a specific material? Has this changed? How do vendors compare across payment and delivery terms, quality of materials received, on time delivery, order and invoice accuracy? 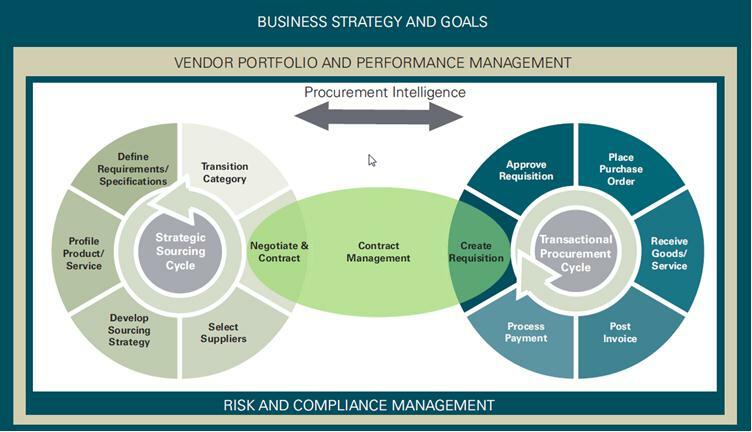 How many transactions are performed for various stages in the procurement cycle? How long does it take to move from one stage to the next in the procurement cycle? How do processing times relate to specific materials, vendors and buyers? What percentages of requisitions are declined? What are the reasons for rejection? How does this compare across commodities, and demand channels? Where are there opportunities for reducing non value added activities? How many requisitions, contracts, and purchase orders are processed across the organization by buyer? What is the average value of each transaction? How is each buyer’s activity distributed across vendors, materials and demand channels? Should buyer responsibilities be redistributed? Is there an opportunity to consolidate transactions with a vendor through one buyer? Are there opportunities for consolidating the purchase of certain materials with certain buyers? 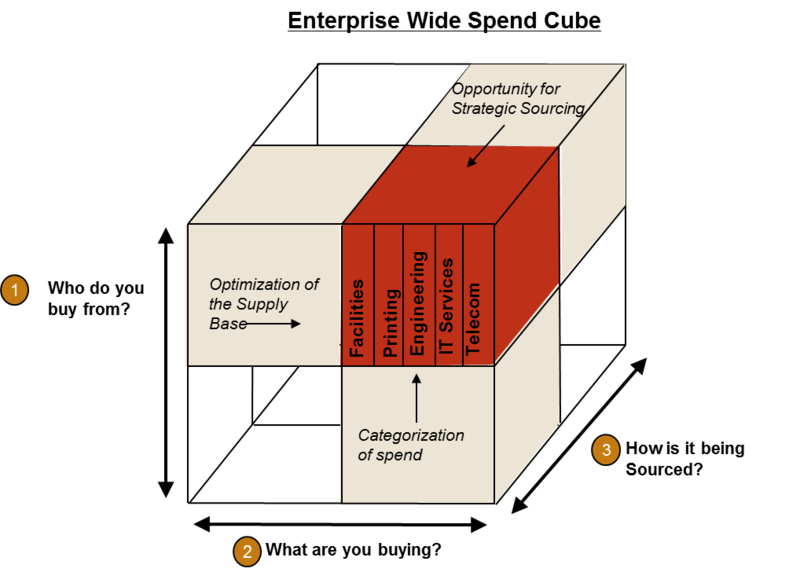 The linkage between Strategic Sourcing and Tactical E-Procurement is illustrated below. BI to support procurement is going to be a growing field as companies look for new ways to adjust costs in a low-growth environment. Spend BI practices are evolving as firms move from department to enterprise, batch to real-time operations, from data profiling to quality monitoring, from US-centric to global, and so on. All these trends boil down to the fact that procurement data quality is broadening beyond its departmental roots into enterprise-scope usage. While this broadening is good for the data, it’s challenging for the organization, which must adjust its business processes to adapt to enterprise spend management. Accomplishing anything with this kind of enterprise spend data quality requires close collaboration among IT and procurement professionals, who understand the data and its business purpose—collaboration enabled by a spend data-governance committee or program. Spend data governance is rare today, but is critical as companies take data quality seriously and move beyond mere stewardship. We recommend spend data governance strongly, because it gives all data-management practices consistency, efficiency, and mandate as they reach for enterprise scale. Spend data governance at an enterprise level in a large global organization requires a mandate. Data stewards and governors must induce technical and business managers beyond their purview to change their processes and data when opportunities for data improvement arise. Without a strong mandate (supported by an politically astute executive sponsor) to drive pragmatic changes, spend data quality, data governance, and data stewardship deteriorate into another nice-to-have activity.